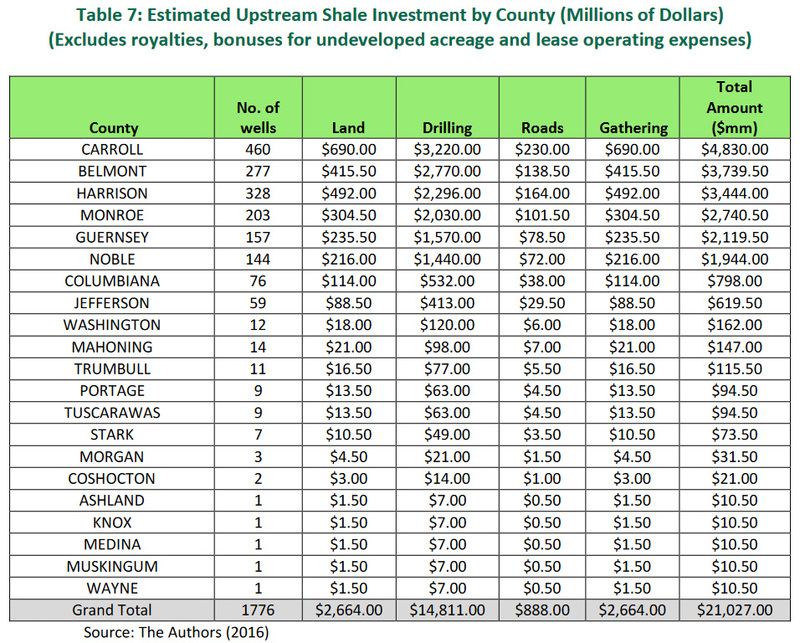 A new Cleveland State University (CSU) report entitled “Shale Investment Dashboard in Ohio” finds total Utica Shale investment topped $50.4 billion from 2011 to the summer of 2016. That total includes $38.8 billion in upstream investment by oil and gas operating companies, $8.1 billion in midstream projects and $3.3 billion in downstream investment during that timespan. Remarkably, these figures could prove to be conservative, as several recent and/or relevant projects were not included in the report. Researchers from CSU and Youngstown State University arrived at their findings by using industry interviews and publically available data prepared for JobsOhio, a private, nonprofit corporation that promotes job creation and economic development for Ohio. CSU’s report estimates Chesapeake has spent an astounding $7.3 billion in Ohio, excluding additional spending on royalties, lease operating expenses, bonuses for undeveloped acreage and taxes. Other shale operators have been pouring investment into the state as well and, as EID recently reported, Ohio has much to gain from royalty payments, as is obvious by the $1.6 billion in estimated royalties paid on production of minerals. The vast majority of these payments have been to private mineral owners, not from leasing of state lands. As EID recently highlighted, leasing federal and state lands can be a major boost to tax revenues and royalties for Ohio. In fact, if we assume the 41,697 acres owned by Ohio Department of Transportation and the Ohio Department of Natural Resources were developed, that acreage alone could mean up to $160 million in bonus payments for the state. This income would surely add significant revenue to address Ohio’s budget issues. Of course without fracking and upstream activities, you would not need midstream investments such as pipelines, gathering and interstate systems. Therefore, the midstream natural gas processing and infrastructure investment detailed in the report is entirely derived from Utica Shale development. The CSU study examined estimated midstream investment from 2011 to the Summer of 2016 in six key categories: gathering lines, processing plants, fractionation plants, storage tanks, railroad terminals and interstate transmission lines. Together, they have accounted for $8.1 billion invested by the oil and natural gas industry. However, the CSU study only accounts for three interstate natural gas pipelines — Leach Xpress, Spectra OPEN and Equitrans Ohio Valley Connector — all of which are either completed or near completion, accounting for $2.35 billion. CSU did not account for the NEXUS project or Energy Transfer’s Rover pipeline, which would add another $5.8 billion to the investment column. These projects together are slated to bring $256 million in new tax revenues. Together, investment made in Ohio by “downstream development,” has been approximately $3.4 billion, according to the report. However, similar to their midstream analysis, this does not take into account several noteworthy “proposed” downstream investments, such as the $5 billion PTT Global Chemical ethane cracker and approximately $7 billion in additional natural gas fired power plants. If these projects come to fruition, this segment investment would swell to $15.4 billion! 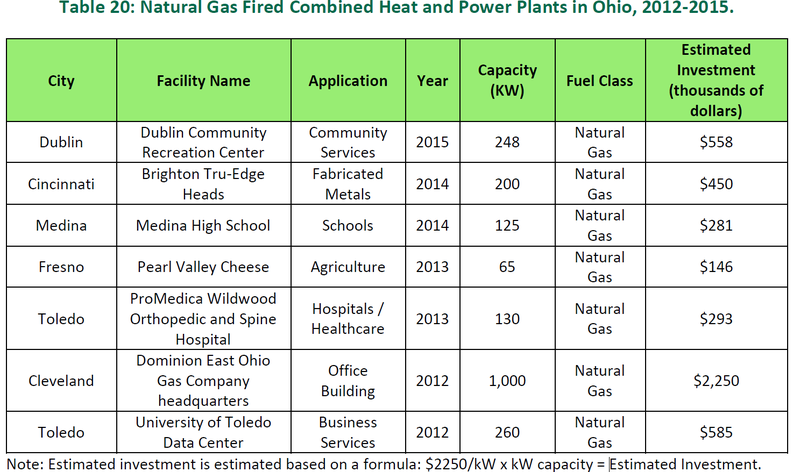 Perhaps the most unsung development Ohio has realized since shale development took off has been the natural gas refueling stations sprouting up all over the states and the incredible conversion of boilers from other fuel sources to natural gas to natural gas. In just five years there have been 37 natural gas refueling stations constructed, adding $37.6 million of new investment. Notably, four new LNG refueling stations and a new Stark County hydrogen refueling station were not included in the report, which would another $2 million to the tally. From our perspective, the most surprising (and exciting) data in this report was found in the analysis of natural gas-fired combined heat and power plants. Over the past four years, billions have been spent in converting old boilers with new technology to burn natural gas. Some of the projects were included in the CSU report, but others such as Cleveland Thermal, MillerCoors Brewing Company and Wright Patterson Air Force Base were not included. 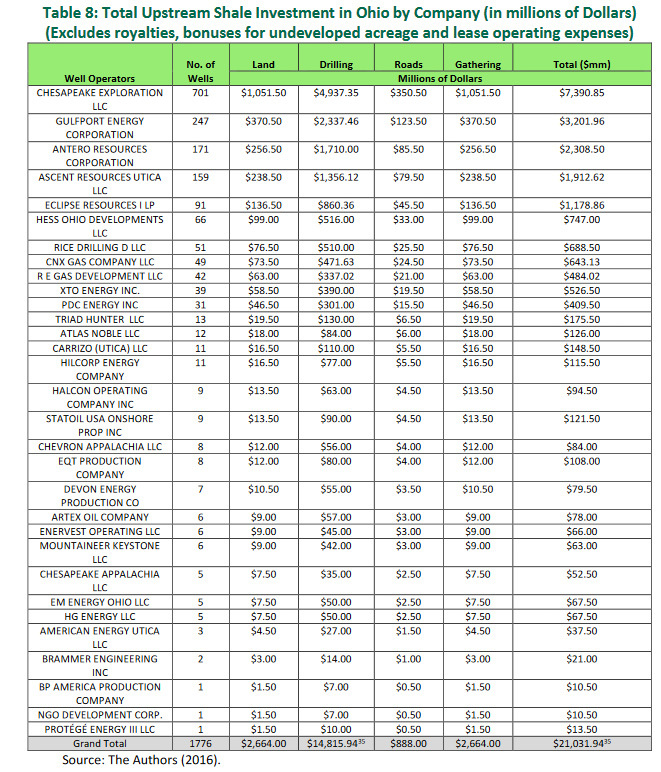 The CSU report has approximately $4.5 million accounted for in its Combined Heat and Power Plants investment tally, but this list doesn’t include these additional significant investments, which would add another $34 million to the stack. What’s more, the millions invested in converting these boilers to natural gas means significant improvements in air quality for Ohioans. Yes, we have — thanks to fracking and clean burning natural gas. What policymakers at both the federal and state level need to understand, and Ohio has proven, is that the shale revolution is not just a win for the economy — it’s a win for the environment, too. Thanks to fracking, Ohioans do not have to choose between stable jobs or clean air. We can enjoy all of the benefits that a thriving economy brings and breathe easy while doing it. The Rover pipeline is in trouble again, this time for storm water overflows on farm fields along its construction route. In a statement released Friday, Rover Pipeline officials responded to complaints from Ohio farmers regarding overflows that the company said are caused by recent rainfalls. Heavy rain has caused pipeline trenches and work spaces to fill with water and spill onto fields. Texas-based Energy Transfer, which is building the $4.2 billion underground pipeline route, said it is working with the Ohio Environmental Protection Agency and the Federal Energy Regulatory Agency, as well as the farmers, to remove the water. This isn’t the first time Rover has had to apologize for its actions. Grassroots groups in Michigan and Ohio filed a complaint Wednesday asking the Federal Energy Regulatory Commission to halt construction of Energy Transfer's Rover Pipeline through the two states and reopen an environmental impact review because of recent environmental incidents. Michigan Residents Against the ET Rover Pipeline and Ohio-based non-profit FreshWater Accountability Project are asking FERC to revoke the certificate issued to the company in February that allowed it to start building the 42-inch natural gas pipeline, which is not yet in operation. "It's going to be an uphill fight, but we put together a string of pretty irresponsible actions by ET Rover," the groups' attorney Terry Lodge said Wednesday. The effort has little chance of success. Read more by clicking here. Area residents will have the opportunity to hear an update on the status of the oil and gas industry in Jefferson County on May 31. That’s when the Jefferson County Chamber of Commerce, in conjunction with the Jefferson County Port Authority, will present a panel discussion and luncheon focusing on developments in the area. Sponsored by Ascent Resources, the presentation will run from 11 a.m. to 1 p.m. at Hellenic Hall, 300 S. Fourth St. Topics include the state of the industry in and around Jefferson County, permits, production, pipelines, infrastructure, investment and more. Speakers will include Amanda Finn, government relations manager for Ascent; Mike Chadsey, director of public relations for the Ohio Oil and Gas Association; Jimmy Stewart, president of the Ohio Gas Association; and Jackie Stewart, state director for Energy in Depth. A question-and-answer session will be included. The Rover Pipeline hasn’t honored an agreement to pay for harm the project does to historic properties, according to the State Historic Preservation Office. The dispute surfaced a week after state environmental regulators proposed penalizing Rover for construction mishaps and questioned whether the project is taking Ohio seriously as it rushes to finish the $4.2 billion natural gas pipeline. In February, Rover agreed to pay the State Historic Preservation Office $1.5 million a year for five years. The money will fund statewide education for historic preservation. Rover was supposed to make the first payment by March 1, but the bill remains unpaid, despite repeated contacts between the State Historic Preservation Office and Rover, according to an April 28 letter from the preservation office to the Federal Energy Regulatory Commission. The letter was filed Friday on the FERC online docketing system. Energy Transfer, which is building the Rover pipeline, says that this claim is inaccurate and they do not owe the preservation office $1.5 million. Click here to continue reading. NEXUS Gas Transmission has presented Stark State College with a $50,000 scholarship donation. According to a news release, Stark State is located near the proposed NEXUS gas pipeline route and offers relevant training for many careers in the oil and gas industry. As indicated by the college, the one-time donation will be used to support industry related programs, scholarships or training facility improvement for students pursuing certification and training to work in the oil and gas industry. If the current state of the U.S. upstream oil and gas industry is what an industry looks like when it has "won" a war, then let's not have any more wars, OK? But that's exactly what some in the energy-related news media would have you believe: that the U.S. shale industry has succeeded in staring down the OPEC cartel's effort to put it out of business and emerged victorious. Several readers contacted me and ask me if that was not in fact the bottom line of the piece I posted last Friday, titled "OPEC Still Fundamentally Misunderstands U.S. Oil Industry." Click here to read more from that article. Organizers of the Coalition to Reroute Nexus say a suit filed Friday in U.S. district court charges that the project violates the owners' due process rights, misuses eminent domain to take property, and jeopardizes their safety. It seeks injunctions against the Federal Energy Regulatory Commission and Nexus Gas Transmission. "This complaint has been a long time in development," said Paul Gierosky, a co-founder of the group. "Our every experience in dealing with FERC and Nexus has been documented and will be brought to bear in this case." Some of this year’s biggest gyrations in U.S. natural gas prices can be chalked up to a single pipeline. Energy Transfer Partners LP’s $4.2 billion Rover line, scheduled to begin partial service in July, will be one of the biggest links from the Marcellus and Utica shale basins in Pennsylvania, West Virginia and Ohio -- America’s most prolific gas production region -- to the Midwest and Canada. Gas futures surged to a 14-week high on May 10 after a regulatory setback prompted speculation that the project would be delayed, keeping supplies from reaching those markets. For a gas market that’s been weighed down by a stubborn supply glut for most of 2017, the timing of the Rover pipeline is critical. An on-time startup would derail progress in whittling down the surplus, unleashing more of the fuel even as hot weather boosts demand from power plants and exports to Mexico and overseas buyers climb. A delay, meanwhile, would keep a lid on gas output from eastern U.S. shale basins. FERC's actions in response to the Tuscarawas River HDD spill came just days after a May 5 letter from Ohio Environmental Protection Agency (Ohio EPA) Director Craig Butler asking for FERC’s help in responding to "numerous inadvertent returns of bentonite slurry at a number of locations throughout" the state, including the 2 million gallon Tuscarawas River spill, which affected "a high-quality Category 3 wetland." Butler told Acting FERC Chairman Cheryl LaFleur that Rover has "taken the position that Ohio has no authority to enforce violations of its federally delegated state water pollution control statutes, water quality standards or air pollution control statutes...Ohio EPA strongly disagrees with Rover's position." Butler added, "In light of Rover's restarting drilling operations today and Rover's position that the state is without any authority to address violations of environmental laws, we are asking FERC to review the matter and to take appropriate action in the most expeditious manner." Prior to FERC stepping in, Ohio EPA issued a series of proposed administrative orders in response to the spills that would require Rover to, among other things, develop a wetlands restoration plan and pay a $431,000 civil penalty. An Ohio EPA spokesman told NGI the orders represent the "beginning of the enforcement process" and that they are in response to the Tuscarawas spill and "at least 17 other Rover-related environmental incidents reported to Ohio EPA's spill hotline." While local media outlets reported that Rover had been fined by Ohio EPA for environmental violations, Energy Transfer spokeswoman Alexis Daniel challenged that characterization. "There has been a great deal of misrepresentation of the facts as it pertains to this issue," she said in an email. She referred NGI back to the Ohio EPA to "get a clear understanding of the specifics of the situation as no fine has been issued. We continue to work with all regulatory bodies with governance over the project to resolve any outstanding questions or concerns." It would appear that the Ohio EPA has issued the fines, but perhaps the reason that Energy Transfer says no fine has been issued is that the company seems to have decided that the agency has no authority over them and can be ignored. Rex Energy will soon be busy in Carroll County, where it plans to drill 12 Utica Shale wells this year. The State College, Pa.-based company outlined its expanded drilling program during a conference call with investors Wednesday. Rex had planned to drill five wells in Carroll, but a new financing agreement will allow the company to accelerate its plans. That means drilling seven more wells in Carroll from the existing Jenkins and Goebeler pads, where Rex has seen strong production of condensate, a petroleum liquid that is lighter than oil but heavier than natural gas. Energy in Depth: Inflammatory Infant Mortality Study a Prime Example of Flawed 'Pay to Play' Science - "An inflammatory new study claiming fracking “kills babies” was published last week by Scientific Research Publishing (SCIRP). The study received zero mainstream media attention, which probably has something to do with its numerous glaring flaws. But it also points to a wider problem – that of subpar studies appearing in what are known as “pay-to-play” open-access journals such as..."
Bloomberg: Oil's OPEC-Driven Gain Wiped Out as Shale Boom Offsets Cuts - "The oil rally following OPEC’s deal has disappeared. Futures on both sides of the Atlantic dropped to their lowest since late November on growing signs that the group’s production cuts are failing to clear a surplus of crude. Oil stocks felt the pinch, with the S&P Oil & Gas Exploration and Production Index slumping as much as 4.9 percent..."
Energy & Environmental Law Blog: Ohio: Updated Statutory Unitization Guidelines - "On May 3, 2017, the Ohio Department of Natural Resources, Division of Oil and Gas Resources Management (the Division) issued revised guidelines for statutory unitization applications. The guidance document–largely rewritten from the previous version (issued in May 2014)—contains a number of notable changes, including the following..."
Seeking Alpha: Chesapeake Energy: The Good and the Ugly - "May 4th was not a particularly pleasant day for shareholders of Chesapeake Energy Corp. (NYSE:CHK). After reporting financial results for the first quarter of its 2017 fiscal year, shares of the business, due also in large part to plummeting energy prices, closed down 7.4%. Seeing as how..."
Forbes: Are Activists Harming the Very Environment They Claim to Protect? - "Over the past seven years, the entire country has read or watched news stories concerning activists protesting pipelines. Beginning first with the Keystone XL (KXL) oil pipeline, and moving on to the Dakota Access Pipeline (DAPL), these activists have forever changed the way..."
The Advertiser-Tribune: Crossroads of Energy Infrastructure - "In western Ohio, the dominant energy technology is from utility-scale wind and solar power. In eastern Ohio, the main technology is extracting natural gas by fracking shale. In Seneca County, they come together in a unique way, said Dale Arnold, director of energy, utility and local government policy for Ohio Farm Bureau Federation. As he understands the federal government’s energy policy, Arnold said President Donald Trump means to allow new and old technology to..."
WKSU: Nonpartisan Coalition Opposes the $300-Million-a-Year Bailout for FirstEnergy's Nuclear Plants - "The proposals at the Statehouse to subsidize FirstEnergy’s two nuclear plants are getting some pushback from about 40 different entities in Ohio. The Coalition Against Nuclear Bailouts has bipartisan support from elected officials, pastors and even organizations like AARP and the Ohio Coin Machine..."
Energy in Depth: Anti-Fracking Donor Memo Mapped Out Strategy to Attack Oil and Gas with Questionable Health Claims - "A strategy memo from 2012 encouraged anti-fracking groups to make connections between health problems and fracking, even when no evidence existed to support the linkage. The goal of the plan, which included leveraging the power of the media and a focus on young children, was to undermine support for oil and natural gas development and expand regulations. The 2012 memo, entitled “Public Health Dimensions of Horizontal Hydraulic Fracturing: Knowledge, Obstacles, Tactics, and Opportunities,” was authored by Seth Shonkoff, who at the time was..."
Ohio Oil and Gas Assocation: Ohio Mineral Owners Score a Win in Efforts to End De facto Fracking Moratorium on State Lands - "It appears Ohio mineral owners have had just about enough of the federal and state government interfering with their right to develop minerals located under their private property. At the urging of the National Association of Royalty Owners (NARO) Appalachia and Landowners for Energy Access and Safe Exploration (LEASE), Ohio Republican lawmakers this week added a provision..."
Ashland Times-Gazette: City of Green Plans Suit to Stop Nexus Pipeline Construction - "A mayor has upped the ante in the fight over a proposed high-pressure natural gas pipeline by hiring attorneys to file a lawsuit aimed at stopping the pipeline from being built or stopping the project altogether. The Green City Council authorized spending $100,000 at a special meeting Tuesday to hire a Cleveland firm specializing in environmental law. This comes weeks after the council agreed to give $10,000 to a group preparing its own..."
Energy in Depth: New EPA Study Indicates Agency is Greatly Exaggerating Methane Emissions - "A new U.S. Environmental Protection Agency (EPA) study released last week indicates the agency may be greatly exaggerating oil and natural gas system methane emissions. By using a combination of extractive air sampling and remote optical gas imaging (OGI) tools to analyze 80 pneumatic control systems across eight well pads, the study found oil and gas methane emissions in Utah’s Uinta Basin are “significantly lower” than previously..."
Bloomberg: Shale Drillers Are Outspending the World with $84 Billion Spree - "U.S. shale explorers are boosting drilling budgets 10 times faster than the rest of the world to harvest fields that register fat profits even with the recent drop in oil prices. Flush with cash from a short-lived OPEC-led crude rally, North American drillers plan to lift their 2017 outlays by 32 percent to $84 billion, compared with just 3 percent for international projects, according to analysts at Barclays Plc. Much of the increase in spending is flowing into the..."
Gas & Oil: Legal Battles Continue in Ohio Over Oil & Gas Rights - "Many Ohio lawsuits between surface owners and mineral owners over ownership of valuable oil and gas rights are being filed, and many others remain active, even after the Supreme Court of Ohio issued its sweeping decision on September 15, 2016 in Corban v. Chesapeake Exploration, LLC, 2016-Ohio-5796. Corban held that the 1989 version of the Ohio Dormant Minerals Act (“1989 DMA”) could only be relied upon by surface owners in cases brought before June 30, 2006. The Court also held that the 1989 DMA was nothing more than..."
Energy in Depth: Wayne National Forest Fracking Lawsuit a Prime Example of Activists' "Litigious Battles to Drive Regulation" - "EID recently highlighted that national fringe environmental groups have promised “litigious battles, to drive regulation” as part of their goal to ban fracking. That effort is playing out in Ohio, where the Center for Biological Diversity, Ohio Environmental Council, Heartwood and the Sierra Club have an axe to grind with the Bureau of Land Management (BLM) and the U.S. Forest Service (USFS) after their numerous protests against leasing in..."
Seeking Alpha: Gulfport Energy Q1 2017 Results - Earnings Call Transcript - "Yesterday afternoon, Gulfport reported first quarter 2017 net income of $154.5 million or $0.91 per diluted share. These results contain several non-cash items, including an aggregate non-cash derivative gain of $106.8 million, and expense of $1.3 million in connection with the recent SCOOP acquisition, and a loss of $4.9 million in connection with Gulfport's interest in..."
Seeking Alpha: Rex Energy's (REXX) CEO Tom Stabley on Q1 2017 Results - Earnings Call Transcript - "Last week we announced the closing of our new $300 million first lien delayed draw term loan. Our initial borrowings under the term-loan were approximately $144 million, which were primarily used to repay all of the borrowings under our former senior secured revolving credit facility and to place $19.3 million of cash on..."
Good morning, guys. Just a couple for you. The increased lay-in budget, was that partly due to, I guess, the Eagle Ford acreage you added in the quarter? And what acreage, I guess, are you targeting? It sounds like you have something pinpointed now. S.P. Johnson - Carrizo Oil & Gas, Inc.
We have acquired acreage in the Eagle Ford and the Permian. Generally it's bolt-on acreage to the acreage we already have. Nearly all of it adjoins something we're already operating. Okay. And in Appalachia, I'm assuming you're looking to sell both assets. And is there a data room open, or is this kind of see what's out there? We have engaged bankers on both of them and are doing teasers followed by data rooms. And any kind of rough estimate in terms of timing or – ? The Marcellus is further along. We've had some data room visits on that. The Utica, data rooms are being scheduled. Click here to read the whole earnings call transcript. The Ohio Environmental Protection Agency has ordered Energy Transfer, the company building the Rover natural gas distribution pipeline, to pay $431,000 for water and air pollution violations at various locations across the state, including Stark County. In its order issued Friday, OEPA also instructed Energy Transfer to submit plans to address potential future releases and restore impacted wetlands along the $4.2 billion underground pipeline route, which stretches from Washington County in southeastern Ohio to Defiance County in the northwest. Work on the pipeline began in mid-February, and state officials say a total of 18 incidents involving mud spills from drilling, stormwater pollution and open burning at Rover pipeline construction sites have been reported between late March and Monday to the agency. Noble Energy, Inc. (NYSE: NBL) ("Noble Energy" or "the Company") today announced that it has signed a definitive agreement to divest all of its upstream assets in northern West Virginia and southern Pennsylvania to an undisclosed buyer for a total amount of $1.225 billion. The amount includes upfront cash of $1.125 billion and an additional contingent amount of $100 million, structured as three separate payments of $33.3 million. The contingent payments to the Company are in effect should the average annual price realization at Dominion South exceed $3.30 per million Btu in the individual annual periods from 2018 through 2020. David L. Stover, Noble Energy's Chairman, President and CEO, commented "The Marcellus has been a strong performer for Noble Energy over the last few years, which is a direct result of the success of our employees' efforts. During the same time period, we have also significantly expanded the inventory of investment opportunities in our liquids-rich, higher-margin onshore assets, which has led us to now divest our Marcellus position. This enables us to further focus our organization on our highest-return areas that will deliver industry-leading U.S. onshore volume and cash flow growth. This transaction also provides proceeds already exceeding our target for 2017, with several opportunities for additional proceeds ahead of us this year." The Company anticipates 2017 production to be within the top-third of its previously disclosed guidance range of 30 to 33 MMBoe with 2017 capital investments expected to be in the top half of its $725 to $775 million range. Additionally, the Company plans to pursue the 2017 divestiture of it Utica Shale asset in order to provide additional focus to its premier Core Wattenberg and Delaware Basin assets.